Your equity might seem like it’s buried in paperwork, but it is real. You can use it to put toward your new home, retirement savings, or even splurge on a vacation. With our low fees, we save clients more than $7,000 on average. Thank you so much for helping me sell my home. You definitely have the golden touch! As you know, my house was on the market for 6 months with Coldwell Banker. One month with you, and I am signed, sealed, and delivered! The difference in commission was substantial. I would definitely recommend you to anyone who is buying or selling a home. Thanks again for all your help! We really appreciate the excellent service that you have provided to us. When we decided to put our home on the market we were expecting a lot of stress and headache. That is so far from what we received! The quick and efficient help that you offered to us was a true life saver. With having two small children and demanding jobs, there was not a lot of time to waste. I will recommend your company to anyone that is in need of buying or selling a home. They will be as free from stress and impressed just as our family was with this experience. Again, we truly appreciate you and your company for making this milestone in our life one to remember with happiness! Having successfully sold three prior homes “For Sale By Owner”, my husband and I have had little experience working with a Real Estate Agent from the seller’s point of view. When it was time to sell our home in Charlotte, we put our “For Sale By Owner” sign out as we had done in the past and waited for our phone to ring. Several weeks and an open house later, our phone was not ringing. We received a colorful postcard in the mail from Don Anthony Realty explaining that there was a way to have a Realtor’s help without paying the large commission fee associated with it and without sacrificing control and strategy for selling our home. We set up an appointment to discuss the details. It made perfect sense to us and we signed on. The house sold quickly and we did not have to pay seller’s commission fees. In fact, Don’s advertising found a buyer who was not using an agent, so we even saved the buyer’s agent commission. Don Anthony helped us every step of the way: determining a good starting price, developing a changing marketing strategy, taking marvelous pictures of our home for the MLS listing (which the eventual buyer informed us was the reason they were interested in the first place), negotiating the contract that we wanted and being there to answer questions right up to the check in our hand at closing. We highly recommend Don Anthony Realty’s service to anyone interested in saving a great deal of money when selling their home. My experience with Don Anthony Realty was wonderful! I received exceptional service. I always received prompt attention to any call or email. I would not only use Don Anthony Realty again but would strongly suggest my friends and family use them. I actually already referred my Aunt and Uncle! The whole experience could not have been easier in what had the potential to be very stressful. 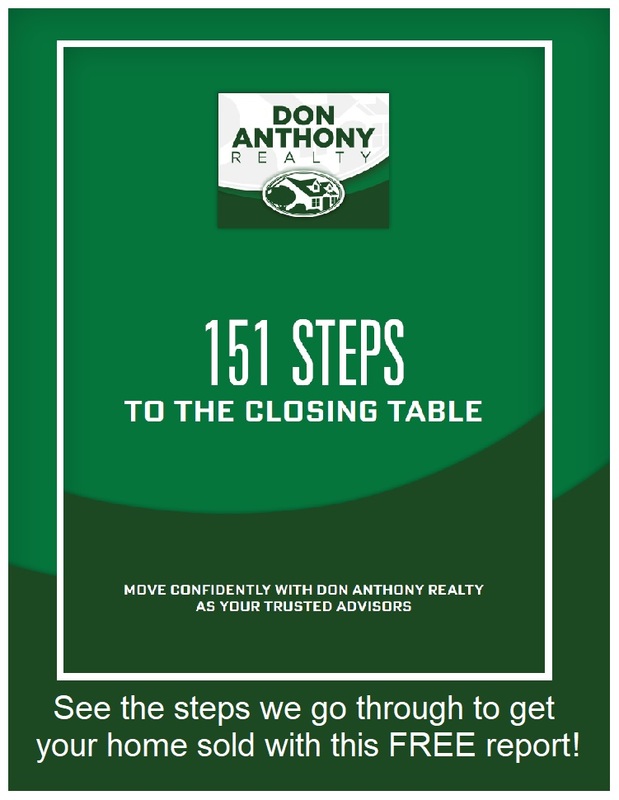 I have the utmost confidence in Don Anthony Realty! It was unfortunate that we could not sell our house by ourselves, however we tried for approximately 3 months. Don Anthony (became) our Realtor, and I HIGHLY recommend him. In fact, I regret that he is not the Realtor getting the 3%. He charged us around $500 to list on MLS, Realtor.com and gave us showcase advertisements on those, gave us a 800 phone number posted on our sign where lookers could call for information, and other misc services. He also negotiated our sale and did an AWESOME job on that when push came to shove. Finally, he handled the closing appointments and paperwork. Don is a VERY intelligent person and great talker, but does not come across pushy or arrogant. Upon closing he received his .5%. If you or anyone you know is interested in selling their house, you may want to consider his services. Hi Don! WooHoo! Thanks for everything! I can’t believe how smooth this process has been! You have no idea what we went through previously! You are responsive, very helpful, and this entire process has amazed us. We will definitely be contacting you when we are ready to buy a new home. I have been passing out your info to all the people I know, so hopefully this will generate additional business for you! Just wanted to say “Thanks” and you will always have our business! One of the most amazing aspects of working with Don Anthony Realty is that they returned your phone calls so promptly. This was consistent throughout the whole process. We never felt like we were alone in making decisions and getting information. Don gave us information about situations even if it meant that he would lose the sale. We trusted that he had our best interests at heart in selling our old home and buying a new one. We loved that we did not have to pay a 6% commission when we sold our home. I think that you have a great concept. I can’t imagine why people would go anywhere else, except that they just don’t know about your company yet. We initially tried selling our condo ourselves with our own signs and website. After six weeks of little activity, we had still had no offers. At that point, we signed with Don Anthony Realty, and in less than a month had two offers – one for full price! Don was very helpful at all times and gave us all the information we needed to make the sale. I’m sure there are higher priced real estate agents out there, and I’m equally sure there are few that are as professional and helpful as Don Anthony Realty! You guys are awesome. We were extremely satisfied with the service we received. We were listed for two years with the “power” agencies and they did nothing to sell our house. After just 2 months with you we sold and got 98% of our asking price and saved a ton of money! We couldn’t have been happier. We will tell everyone about you. In fact we were referred to you by our friend who was in the same situation. They had the house listed with full-priced brokers, had no luck and couldn’t sell, and after putting it with you guys their property sold in just 2 days! They are sold on you and now I am sold on you and so will everyone who I can talk to in the future. If anyone is looking to sell or buy, they should contact you. You save people a lot of money when they go with you, as you sure saved us a ton and sold our home! We listed with you, and in a month you had sold our townhouse. We both would like to thank you very much! Don Anthony Realty was quite a blessing for us in selling our home. Don was very helpful and always courteous. His expert advice and guidance were greatly appreciated and exceeded our expectations. I would recommend Don Anthony Realty without reservation to anyone looking to sell their home. The [Home Profiting™] “system” worked for us. As soon as our house was listed, we began to receive calls from agents. Our house sold in three days, and we got our asking price. We estimate that we will save almost $12,000 versus what we would have paid under a traditional real estate structure. It was a pleasure to work with you on the sale of our home and have already recommended Don Anthony Realty to friends looking to sell. We realized after trying to sell our home on our own that we needed to list our home on the MLS to attract Realtors to bring in clients. Don Anthony Realty proved to be a very cost effective way to get our home noticed. This was the first home we have sold, and found your expert advice very helpful and enlightening. We would definitely recommend Don Anthony to others. On behalf of my wife and I, THANK YOU. We will give your name and contact info to anyone we hear of trying to sell their home. Damn good job! So far this has been exactly what we wanted! We felt badly after using a traditional broker last year. I was nervous doing a FSBO. You were exactly what we want and needed to list our home. Thank you for such a great program. We sold our home within one week of listing it with you and were able to save thousands! Thank you! This is the future of real estate. We will be recommending your services to all of our friends. I want to thank you for your help in getting my home sold. Remain certain that my friends and family will keep you in mind for future Real Estate sales or purchases. This new way of listing my house saved me over $20,000, and the house sold in two weeks. Your service is amazing and everyone should try this approach before using a traditional real estate agent. I am glad that I found you. I listed with Buy Owner before and it was a $5,000 mistake! I must admit, I was a bit skeptical when I first learned about [your program]. I thought, “How effective can this company be in helping me sell my home, when they charge so little?” Well, when you really think about it, how can other “full service” brokers get away with charging so much? [They] did everything I needed them to do… I had a contract on my house in one week, and they didn’t stop there. They helped me through the entire selling process, all the way until closing. They got me the information I needed, when I needed it. I will certainly spread the word. I just wanted to write and say thank you for all of your help with the purchase of our new home. I thought that I did not need a realtor since it was a new home. I am glad I changed my mind and decided to use your company; you were very helpful with the interpretation of complex contracts, negotiations and on the walkthrough. I had a great Don Anthony Realty experience and would not hesitate to recommend friends and family. Thanks again! This program is awesome! I have sold two houses using it and have been pleased with the price, the savings in my pocket, the efficiency of the listing process; and basically, the whole situation! This is the way of the future of real estate. I won? do it any other way! Thanks to [you] our house went under agreement after 1?weeks on the MLS. I? so glad that we can move back to Massachusetts without worrying about the house. I wish I had the time and energy to call the many Realtors who told us that For Sale By Owner homes take a long time to sell. We estimate that we saved ourselves about $8,500, and it was not hard to do. Don? let the Realtors fool you into thinking that it is. We would absolutely, without reservation, recommend you to everybody! We were a “For Sale by Owner” and had a great house with only minimal traffic. The traffic that was produced after we put the house on the MLS was night and day. We sold for a high price in record time. Thank you! I saved over $13,000 in commissions on my sale. Why pay more? I had a good house in a popular area and didn’t need to pay all that commission. Your service is an exceptional value! I would definitely use this service again and would tell anyone who is pondering it to do it! It was cost effective and got the job done. I am extremely pleased! I am impressed with your idea and I think it will be THE way to sell a house within ten years. In today’s world of technology, the need for the traditional realty services has changed greatly. Unfortunately, the services offered have not kept up with the times. The almost zero flexibility and excessive fees are pushing more and more potential clients away to do their own thing, but for most people a little bit of hand-holding would be great. The solution to this problem was found for me in [your program]. A la carte services offered can be shaped to fit very different individual needs, and the cost-saving and flexibility is what’s missing in the traditional market. I want to thank you for starting up such a new and innovative company. Your company is exactly what I was looking for to help me sell my home. The day I put your sign in my yard I had five people want to come through the house, and it continued that way every day after for two weeks. We then received an offer that we accepted. Thank you for helping me save thousands of dollars. Good luck to you and your company. Absolutely, this is the best deal in town! Quick at getting us in the listing services, professional with awesome advice, and a quick sale! I only wish that I would have known about and used your service earlier in my effort to sell my house. I would not have wasted the first two months as a ?y owner? As a beginning investor, I really appreciated all of your help and that of your office staff as well. You can be sure to hear from me again when I have my next house to sell. WOW! What can I say? We tried to sell the house on our own for three months with no results. The day after we listed with [you], we had a contract on the house and are closing the next week! Yahoo! I’m recommending you to everyone I know! Be Happy! I think that you are really on to something and will end up taking a lot of listings away from the ReMax’s, Coldwell Bankers, Century 21s, and For Sale by Owner. With more and more people becoming Internet savvy, the leg work that the real estate agent used to do is now at the finger tips of the buyers and sellers and makes them wonder why they need to pay such a high commission. Your service is perfect for us because we feel that the listing agent’s job is only to take down our information and transfer it to the computer. This concept is outstanding where no other is! The service was great, efficient, speedy, and, more importantly, a cost-saver for me and my family. [You] provided the information, resources, and expert help when we needed it. Plus, we saved about $10,000. What’s not to like?! We closed today and want to thank you so much for your help. You have an awesome program, and we are constantly telling our friends and associates about it! Keep going you are doing great things! I just wanted to thank you for a job well done on both the sell of our old house and the purchase of our new house. Both transactions went very smoothly and were financially beneficial to us as compared to using a traditional real estate process. I think your concept for both the sell and purchase transaction is the way of the future for smart homeowners. Since I am also in the business of helping consumers, I really appreciate a true value added service such as yours! Keep up the great work and the next time we decide to sell, you will be the first person I call. In addition, I continue to recommend you to everyone I know who is thinking of selling or purchasing. Thank you for your services in assisting us in finding a home. We’ve been in our home for three months and are still thrilled with our purchase, and we can thank you for helping us find our home. Your dedication in working for your customers was clearly demonstrated in your tireless efforts in finding the perfect home for our family. We truly felt we had someone working for us. You demonstrated this by even taking our offer letter to the seller in a face-to-face meeting to make sure that we were coming up with an offer that worked to our favor. When we first met to discuss your services as a buyer’s agent, you told us that you would “work to represent us and our interests”. You definitely did that but also exceeded our expectations. I don’t know how I could have done this with out your help… and the fees were so reasonable. Wow, less than a week – amazing! Not only did we save money, we made money! I have been very pleased with the whole process, and I will buy and list all my homes with you. You’re on the ball! I knew that I like you from the moment I saw the contract. Sold in a week! I didn’t really believe it could happen! Thanks! Thanks for your input on the contract. It was really helpful. Everyone I know is going to use you! I appreciate everything you’ve done! Compared to For Sale By Owner, this has been a dream. I never expected to get one offer this close to Christmas, let alone two. You’ve been very responsive in the urgent situations dealing with two offers and analyzing the offers to determine which is the best! Thanks for all your help with this transaction. This is the first time I have had the opportunity to work with your company. The experience has been very professional and punctual. [You]made selling our home efficient and economic. Thank you so much. Thank you so much. So glad that I found your company and will continue to refer friends your way! We had our closing this morning, and everything was fine. Thanks for your assistance. We will definitely tell all our friends about your services. I tried selling my home a year earlier with ‘Buy Owner’ and eventually took it off the market after over six months with no sale. Then, after placing an ad in the [paper], you called me, and I gave you a chance at selling my home. Your energy and the low cost made it worth at least a try. You sold my home in three weeks! Thank you! Wow! Thank you so much. I was impressed by your services, amazed at your prices, and ECSTATIC with the results. We appreciated being able to contact you any time, anywhere, especially when our buyer wanted to deal immediately. After a flurry of paperwork and faxes, we had sold our house for what we wanted. I only wish we had found your services sooner. If we ever try to sell a house again [here], we will only use you. Thank you again and best wishes for your successful future. Just a note on day of closing. Bob and I appreciate the extra efforts you extended in order to ensure a successful transaction. We hope to send you some referrals soon. We found the professional service to be helpful in saving money and we were serviced with immediate response as if we had paid for a full service agent. Just do it, you won’tregret it! Just looked at your listing details. Great job! I could not have done better myself. Thanks. So many problems we couldn’t have thought of without you. You got us through it all! [It] has been great. Not having to pay the seller’s commission allowed me to sell my place faster and make more money. You have helped so much and have been very patient with getting us through problems with our buyers. Thanks for helping me sell my home earlier this year. It was such a relief! I will continue to pass on your name. It’s been some time now since we’ve completed the sale of our home. It was through your hard work and experience that we were able to make it a successful close. We want to express our gratitude for the time that you spent with us answering our questions. We certainly feel that you went beyond the call of duty. We’ve had the opportunity to talk with many of our neighbors about the sale of our house, and we recommend your services all the time. Once again, thank you very much in helping us sell our home ourselves. Thank your for your help and service that you provided. Just wanted to say thank you so much for helping me with the endless phone calls to get this house closed. We could not have done it without your help. You guys are great at what you do, and we really enjoyed the opportunity to work with you and get the job done efficiently and yet save money too! Thanks again. Thanks again for your help in listing my home. I was extremely satisfied in your company’s low cost options and flexibility in choice. I felt as though I was the one making the decisions on how much service I want to pay for as opposed to some law or an “I know what you need” attitude. Your company allowed me to sell my property the way I wanted or choose to ask for as much help as needed. Many thanks! Simple way to get quick exposure in front of real estate agents. Though I cannot speak about other situations, my home was under contract one week from the initial day of listing. We chose to have you list our home in multiple listings and help us through the negotiations of the sale. Of course, if there were other services that we needed, we could have purchased them from you. We really feel that we had all the benefits of a real estate agent without paying the extra costs. Our home sold in less than two months, and we saved mega-bucks. We loved it! If we ever sell our home again, we will most definitely call you; and if we have friends or neighbors who are contemplating selling their home, we will let them know about your service. It was a pleasure working with you. Using your service provided us with quick access to multiple listing services and brought traffic through our home immediately with a sale in two weeks. You did a wonderful job on our listing, with great pictures, which we think definitely helped with the quick sale of our home. For anyone who is looking to save some money, your service is definitely worth a try for anyone considering selling his home. Thanks for your help in the sale of our home! Good luck with your business. Thanks very much for your services. I believe you are on to something! I wish you success and good luck. Craig and I wish to applaud your services for the listing of our home in Glen Abbey. You understood the needs of us as homeowners when listing our home, especially when other realtors only saw us as quick cash. Many realtors called us to list our home but never even took the time to show it. As a real estate professional, you know what it takes to market quality homes, and we appreciate all you did for us. Our home showed beautifully on the MLS listing in the many pictures you took. Our home was priced right, and we got what we wanted without paying excessive realtor fees. Thank you for a job well done! I just wanted to take a second and thank you for your efforts in selling our home. Even though the first buyer fell through, we had a second buyer within a month. As we are building a home and selling ours was a contingency, having the peace of knowing we can move now that we have a buyer is a great relief. I love your a la carte service and using your service helped me save money from commissions that will be used on the new house. Thanks again, and I look forward to doing business with your company in the future. I will, and have already, continue referring your company to all of my friends. Thanks for your help. I love your project, and I am very happy about saving the extra money. We go to closing in the morning. Do you want me to do something with the sign? Hope to see you again, AND I certainly will be an advocate for your agency. What can I say… Easy, Affordable, Results! This is easy to use, yet superior advertising to any other real estate business model. Overall, I would say that I am very satisfied and will definitely tell my friends and use you again personally. I can’t believe the traffic I am getting on the very first day of listing with you. I would definitely use you again! I listed with you after listing with Buy Owner and spending thousands. What a mistake! I enjoyed my short association with [you] and will definitely go with you all again next time I’m selling a home in the local market. Hope things are going great for you. Ever since we sold the house with you guys (in thirty days!!!) at a higher price than we had it listed with our previous agent, I’ve been pushing your company and services to anyone with a house on the market. Hope it works out for them and you. Thanks so much and continued success! I would definitely recommend [this concept] to anyone interested in maximizing their exposure to the market and minimizing expenses. We had a contract on our home within ten days and closed within a couple of months. We saved half the commission with little to no extra effort. The tips we got on making the house more aesthetically appealing were right on the mark. All I can say is that I could not have done it without you! We had a difficult buyer, and you did the work of a full-service agent for so much less. I appreciated your hard work. The whole process was very smooth. We will continue to recommend your services. Thanks for everything. You guys are great! Thank you so much for everything! We couldn’t have closed without you! Thanks for helping me sell my home! So far my experience with your process has been awesome! I am very glad that I decided to go with [your service]. I am telling all of my friends and family, anyone that is in hearing distance of my voice. We listed my house on Tuesday and by Sunday I had an offer, and in a week I was under contract. That is just AWESOME! I am looking forward to the walk through on Friday. Thanks for all the guidance through your emails. Have a great day! We are under contract within twenty-four hours, I hope a record for your new company! Comparable to having a full time agent without having to pay for it. We had a ton of traffic. Very happy with the exceptional service. We sold our home in three days and got 99% of our asking price! Great service, got the job done! It’s a great concept, and I wish you all the best with your business. I am referring my daughter to you. Great service. It was a pleasure working with you on the above referenced closing. Your professionalism and cooperation made a big difference and made this a very pleasurable experience for everyone. I look forward to working with you again in the near future. A note to express my thanks and sincere admiration for the way you run your business. Within one day of you posting my home in the MLS, the traffic increase was amazing. Your responsiveness, willingness to patiently answer any questions, and lightning fast turn around response to calls and emails was excellent. I know many others who have paid thousands more for so much less customer service. Forget traditional selling agents – I’m sold! [You] provided all the services of a traditional realtor at much less cost. Our home sold very fast for a few thousand less than asking price, and [you] provided all the necessary information and instructions on exactly what to do to prepare for the sale and closing. Thanks. I wanted to take time to just let you know how valuable your services have been to my wife and I. I can’t say enough about you and your services… they are the best. If anyone has any doubts, I can rest them assured that the way you do business is unequalled. In every respect, you have given us invaluable advice in listing our home. I want you to know that as a builder, this is invaluable information and strategy! Furthermore, whenever I have asked for your help you not only have always responded positively but very quickly. I could not ask for more. Please let me know if there is anything I can do to help you, because you have certainly helped me, and I could not recommend your services more highly. We appreciate all of your help in the sale of our investment property. With your guidance, we were able to make this a success. Because of your help, we were able to make more of a profit on our sale. We will definitely use your services again and also recommend you to others. Thank you so much for everything! We had our reservations about going with a realtor with a flat rate but no one could have been more professional or could have gotten better results for us! We saved money and sold our home for full price. Keep up the good work! What a great experience! Your service provided all the necessary exposure to sell our house and at a savings of thousands. Thanks for your expert advice on “pricing it right”. As a result, our house sold quickly and very close to the listing price. We were shocked to learn our home’s value was over $600,000 when we decided to sell. We listed with a traditional realtor and reluctantly faced paying $40,000.00 in commission. When it didn’t sell we pulled the listing and called [you]. [You] listed our home for a flat fee, put it on all of the websites, and within 2 weeks it was sold, for $50,000 over list price and with a total marketing cost of less than $4000. That’s the way it should be! Nothing that any other realtor could have done would be worth $40,000! I really didn’t expect you to sell my property in 6 days. Wow! I tried selling earlier with another agent with no success. I’m impressed. Thank You! I did not want to list with a normal “selling” agent because our experience with such a traditional realtor has not been good, no real marketing, just a sign in front and website coverage only with their office. We could do the same! Wanted to be in MLS, but without signing with a traditional listing agent. Too high a fee. Like the whole concept of what you are doing, website support to pricing. I decided to utilize your services because you offered me a great package at a reasonable cost. One of my goals was to get as much exposure as possible. With your firm, I am on all crucial real estate Internet sites. Your sign alone is keeping ten real estate agents a day from calling for a listing; but the agents know that, if they have a buyer, they are more than welcome to show the property, and they will be paid. I have a lock box so that the property can be shown at any time. I also know that if I need help, I can pick up the phone and call you. After all of that, I still have the flexibility to sell the house myself without paying any commission. I believe you offer a great service. It fits my needs perfectly. We listed with you to save the listing commission and be able to offer the new owners of our home a better price. We listed with [you] for one huge reason: relatively low cost listing on MLS, and Realtor.com. It was very intriguing to be listed with a realtor and still have the ability to sell completely on our own and save ALL of the realtor’s fees or to save HALF of the realtor’s fees when the buyers already have a realtor. We listed with them a week ago; and now that we have hugely expanded our advertising potential and are “out there” where people can find us, we are beginning to see a great deal more interest from prospective buyers and realtors. I listed with [you] because, as a full time investor, I have a lot of properties for sale at various times, and the services provided by [your] firm give me an edge in selling my houses. Also, the fee structure and the fact that I am not precluded from selling the property myself give me more profit. We listed with [you]……….for a number of reasons. Our goal is to sell our home but felt that the conventional commission fees are excessive. We also felt that the multiple listing services as well as the Internet were the primary ways other Realtors would see that we have a home that might work for their clients. If the realtor would still get their normal commission and we would only have to pay $500 to get the word out, it seemed like a win-win situation. With [your service] you can still have the option of selling privately; and at the same time, choose to sell with a realtor. The fee would be 3% instead of the conventional 6 or 7%, which is much more realistic. I chose to list with [you] because of the exposure on MLS, and Realtor.com as well as the low commission rate. I love the concept. I was very impressed with the website, persistent follow-up, and I felt the program is perfect for my needs. I listed with [you] because I didn? need to hand the listing over to an agent and wanted to save the money on the commission. First attraction was low cost and then after looking through the website, it seemed like an efficient way to sell our house. We were planning to sell our home ourselves but thought why not add professionals to the process as well. It gives us the power to keep our money. After researching all the alternatives, we concluded that [you] provided the best service for the money. My company is not reimbursing me any of my fees for my move so I had to stretch the dollar as far as possible. I was looking at sites on the Internet and found yours. We compared you to others and decided that you were definitely the best. The last time we sold a home it didn’t even make in the MLS three days, and it was sold. It was not worth 7%. In comparing you with other brokers, the comprehensive marketing and services package that [your company] offers made it a cost-effective method to sell my home. We had a friend who has a friend who told us about you, and they said they tried to sell ?uy owner,?but it didn? work. Then they listed with you, and they sold within a couple of weeks. I compared you to other sites. Checked you out and chose you. It was an easy choice! We used [them] after having our home for sale “Buy Owner” and not receiving a lot of activity. We had already done our own marketing and needed a good source to get on the MLS. [They] are always there to answer questions; and within twenty-four hours, our house was listed on the appropriate sites. We are glad that we are using [them]. What city are you selling or buying in?